U.S. relations with the Kingdom of Cambodia have become increasingly strained in recent years in light of Prime Minister Hun Sen’﷿s suppression of the political opposition and his growing embrace of the People’s Republic of China (PRC). During the previous decade, U.S. engagement with the Kingdom slowly strengthened as Western countries continued to pressure Hun Sen to abide by democratic norms and institutions and as the U.S. government attempted to prevent Cambodia from falling too heavily under China’s influence. Following strong performances by the opposition in the 2013 and 2017 elections, the Cambodian government banned the largest opposition party, the Cambodia National Rescue Party (CNRP), in 2017. As a result, the ruling Cambodian People’s Party (CPP) ran virtually unopposed in the 2018 National Assembly election. The Trump Administration and Congress have imposed sanctions in order to pressure Hun Sen into restoring democratic rights and dropping criminal charges against opposition leaders. While the U.S. government has criticized Hun Sen’s backtracking on democracy, it also has sought to remain engaged with Cambodia. 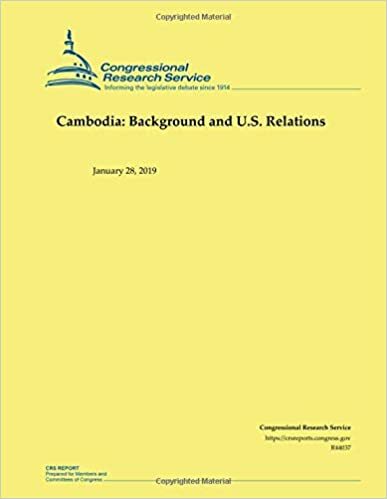 During the past decade, U.S. interests and foreign assistance efforts in Cambodia have included strengthening democratic institutions and norms, promoting the rule of law, increasing bilateral trade and investment, supporting economic growth, reducing poverty, and improving public health. The U.S. government has supported demining and related activities in Cambodia, which is among the countries most heavily affected by unexploded ordnance (UXO). Military engagement has included U.S. naval port visits, U.S. military assistance and training, and joint exercises. The United States and other countries have provided funding for the Extraordinary Chambers in the Courts of Cambodia (ECCC), also known as the Khmer Rouge Tribunal, established through a 2003 agreement between the government of Cambodia and the United Nations. Since the court commenced proceedings in 2006, it has convicted and sentenced three former Khmer Rouge leaders for crimes against humanity and war crimes committed during the period of Khmer Rouge rule (1975-1978). Following the conclusion of two trials in November 2018, the Cambodian government announced that the ECCC’s work was concluded, despite calls by some Cambodians and international human rights groups to prosecute additional Khmer Rouge officials. In recent years, PRC assistance to Cambodia, by some measures, has begun to match total annual foreign aid flows from traditional major providers of official development assistance to Cambodia. China’s economic support has given Hun Sen greater political room to maneuver, according to some analysts. In return, Cambodia has appeared increasingly willing to accommodate or support Beijing’s positions on various regional issues, including territorial disputes in the South China Sea. Japan is the largest provider of Official Development Assistance and second-largest source of foreign direct investment in Cambodia. One of the poorest countries in Asia, Cambodia has performed well on some socioeconomic indicators since the United Nations brokered a peace settlement in 1991 and restored a constitutional monarchy in 1993. The Kingdom’s economy has achieved an average annual growth rate of 7.7% since 1995, driven by growth in the agricultural, construction, garment, real estate, and tourism sectors. China, Japan, South Korea, and Southeast Asian countries are the main sources of foreign investment. The United States is the single largest overseas market for Cambodian merchandise exports, which consist mostly of garments and footwear.